Sam Bailey Leadership: Mine, Yours, OURS! Lay out the play area of at least 30' x 30'. Put a circle in each corner, and one in the center of the area of play. Place all the balls in the center circle. Teams begin by standing in or behind their circle. In three minutes, your team's objective is to have all the balls inside your circle. Give 2 minutes for each team to discuss strategy before trying the game again. Return all balls to the center and do another round. More than likely there will be no winner again, so have all the teams return their balls to the center circle. Have the teams gather around the center circle and share ideas as one large group about what they've learned and how they might win. Answer questions that players may have and read the objective and rules once more if needed. Hopefully, someone will ask about moving their circle - and YES, you can. 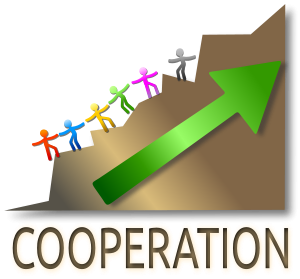 The idea is team cooperation rather than competition. The only practical way to win is to have everyone win -- have all the balls in the center, and then put every team's circle on top of the circle that is there. When did you discover that it was not possible for only one team to win? What did you do when you figured that out? Do you think people tend to be more competitive or cooperative? How can we apply the concept learned from this activity to other activities we do?